The Intercultura Foundation held an international conference in Milan, Italy from the 7th to the 9th of April 2011 on the topic of Reconciling Babel: Education for Cosmopolitanism. The purpose of this conference was to reflect on what it means today to be a global citizen and on how young people may be educated for this citizenship. Dada Shambhushivananda addressed a plenary session and gave a workshop on the topic “Roots for Societal Transformation” which introduced NHE as a response to the tensions emerging out of drive towards cosmopolitanism. We are living at a special moment in history when the social and economic systems are in turmoil and the natural world that sustains us all is equally turbulent. Furthermore, the opposing narratives of people sharing the same biosphere pose both challenges and opportunities. In addition, the global information revolution led by a host of technological advances goad us to squarely face the stark neglects and widespread global disparities in all walks of life. It is this cry which leads us through empirical, systemic, world views unto mythical analysis and brings us to a neohumanist perspective. Neohumanism, the philosophy and practice of love for all beings – living and non-living as propounded by Indian philosopher and seer P.R. Sarkar (1921-1990), attempts to reconcile inner and outer; individual and collective; tradition and modernity; rational and intuitive; material and mystical; local and global; living and non-living; and pragmatism and idealism. What lies at the core of global citizenship? How to foster and strengthen social and natural resilience? What should be the pedagogical response to shift human consciousness towards a world guided by a balance of individual liberty and collective interest? We are all different in many ways, similar in other ways and identical on some level. Identity is not about the multiple roles that we play in society. Rather, it is the essence of what we call ‘me’ or ‘us’. It is the combination of all three- our physical, psychological and spiritual dimensions as they inter-relate with the world around us. Yet, at the core of our existence is the universal-spirit. When we get disconnected with the universal spirit- universal love and universal consciousness, we become like a tree which is cut off from the roots and soon the tree of civilization begins to become dry and ultimately dies out. Hence, the only way to revive the elan-vital of human civilization is to bring back that essential component in our life styles- the practice of love and compassionate perspective towards all that appears different and varied. It is with this perspective that we need to eliminate the wide disparities prevalent in the world today and yet preserve the diversities that add to the beauty of human civilization. To maintain this harmony, it is also essential to spell out the cardinal moral/ethical principles as distinct from the local cultural differences. A 21st century cosmopolitanism must be based on these ethical principles if it is to last. Unless we modify our lifestyles and bring them into alignment with our spiritual journey, we shall not be able to remove the dichotomy that exists between me and them. Towards this end, the yoga and meditation methodologies were also discussed as an integral part of any coherent neohumanist response. Through connecting with our deepest inner-self, we also get connected with the universal cosmic-self that pervades the entire creation. Resilience is the ability of a society to survive and thrive in the midst of crisis and all odds. In order to build resilience, the inherent potential of each community, rather each citizen will need to be tapped. People become empowered when their inherent longings are satisfied with the least cost to the rest of society and nature. 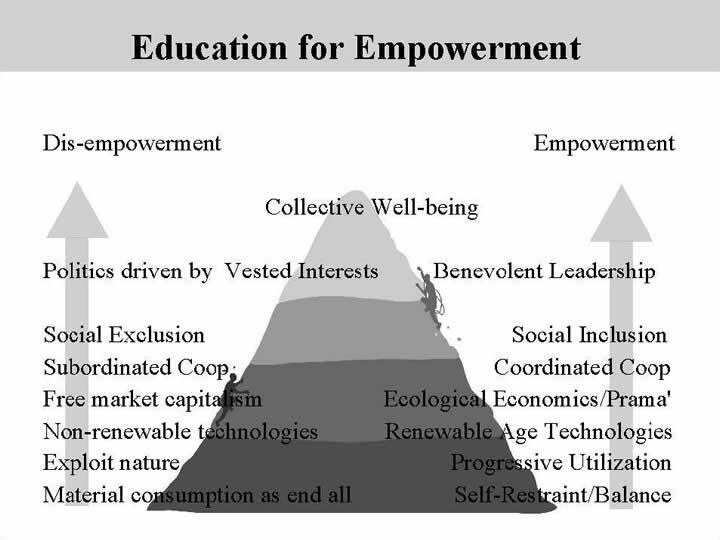 Hence, an empowerment model should enhance the welfare of each individual, society and nature through a quadruple bottom line – economic prosperity, social inclusion, harmony with nature and spiritual growth. This is the focus of Neohumanist Education. The future of society will greatly depend on recognizing the emerging paradigm which calls for the end of modernity and its outmoded ideologies of patriarchy, individualism, materialism, dualism, nationalism and even humanism. Instead the emerging paradigm points towards a partnership model, multicultural reality of human experience, empathetic civilization, and recognition of self-realization and ecological ethics. In order to build a resilient society, we shall have to choose the empowerment modalities which call for a socio-economic system which encourages regional self-reliance in all basic amenities of life. PROUT (Progressive Utilization Theory) is one such approach . It invites abundance by streamlining our economies in harmony with nature. By showing restraint in exploiting the planet’s fossil fuels and by tapping the abundant renewable potentials of nature, we can reverse the trend of increasing scarcities. The tensions of global citizenship remind us that we are a fragile link between the past and the future and our choices today will inevitably condition our options tomorrow. In summary, we need a neo-magna carta which will establish the rights and responsibilities of all beings – living and non-living; we need to spell out universal ethics that go beyond religious nomenclatures; we need to adopt a socio-economic system that will strengthen and empower local communities and help improve the purchasing power of each citizen and not only a few while neglecting the majority; and, we need to modify our lifestyles so that we do not pursue happiness at the cost of pain to others. Thus true development would be that which is built on our local resources and not based on draining others’ resources for feeding the consumption of a few. Hence, the task of neohumanist education is to affirm and express our self-realization modalities while bringing to centre stage thinking and action based on ecological ethics and social justice especially in all our inter-cultural dialogues.